Whether a change management consultant, a leader or an employee, having the ability to assess personality traits is key to navigating organizational culture and office politics, and driving change. When I first learned to do this, my instructor began with this lesson. I call it the Listening Game. That is because I was to listen. I was not to think. People will easily and often tell you their traits. They will do this even if they do not intend to do so. Listening allows us to catch these tells. Thinking about what they say distorts what we will hear. Whenever people talk about someone or something, they are talking about themselves. If they criticize or praise someone, they are criticizing or praising themselves. If they tell us what they like or dislike about something, they are telling us what they like or dislike about themselves. While this is not always true, more times than not, it will be. For one day, I was to assume it was always true. The results shattered me. I saw how much people were saying about themselves. I saw how much I was missing. 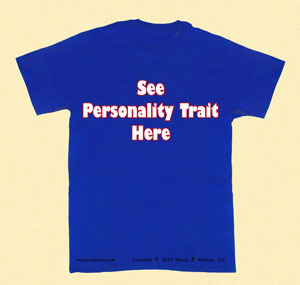 To assess personality traits all we need to do sometimes is read the person’s t-shirt. There are three basic reasons why this works. It works because of projectionism. People tend to project onto others and things the traits they do not like about themselves. Shakespeare’s line in Hamlet, “The lady doth protest too much, methinks,” is based on this. A common everyday example are people who talk a lot. They get very upset with others who do the same. Another reason is because of identification. People tend to identify with traits that they like in others and in things. If people like someone because they are organized, then they like that trait. Most likely they have it too or at least aspire to it. The final reason why this works is that we do the same. As we begin to think about what people say, we color it. We distort it. We ruin its value to assess personality traits. Most times it is easy to assess personality traits. It is clear. Someone joked he was a control freak. Someone else laughed and said she was too stubborn to change. Listen. The jesting does not matter. Do not think. Listen. Read t-shirts with phrases and words. Do not think. They shout their owners’ traits. Listen. Do not think. Play the game. Do it for one day. Be amazed.